From the article Amino Acid on Wikipedia, it states that Proline is a special case, Tyrosine is hydrophobic and Cysteine is also a special case. From Khan academy, it also states that Proline is polar, Tyrosine is nonpolar and Cysteine is polar. From Pearson Prentice Hall's Biological Science, it states that Proline is nonpolar, Tyrosine is polar and Cystein is polar. From BioNinja, it states that Proline is nonpolar, Tyrosine is polar and Cysteine is nonpolar. The article Proline supports Proline is nonpolar. The articleTyrosine supports Tyrosine is polar and hydrophilic. The article Cysteine states that Cysteine is polar and hydrophobic, AS WELL AS Tyrosine. Please help me to clear out the confusion, why the polarity and hydrophobicity of these amino acid are not agreed with each other? TL/DR: these are borderline, complicated cases. There is no broad consensus on whether cysteine and tyrosine should be considered hydrophobic or polar. Proline is clearly nonpolar though. The reason for the confusion is that are there several ways to define and measure polarity and hydrophobicity for amino acids. First, the polarity and hydrophobicity of the free amino acid is very different from that of the amino acid side chain in the context of a peptide (protein). I assume you are interested in the latter. 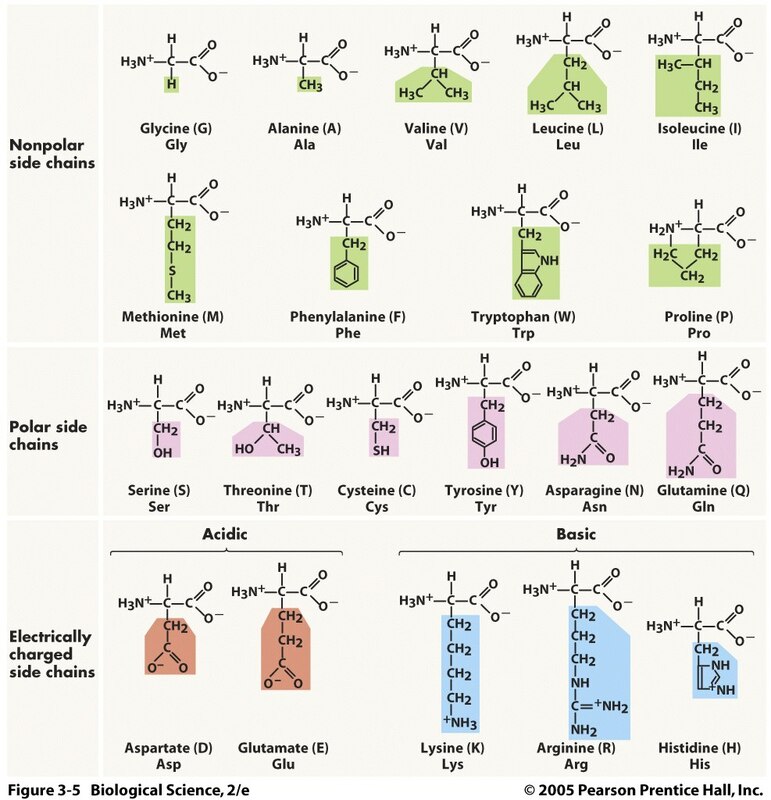 Polarity is rather difficult to define for amino acids. The dipole moment is the usual measure of polarity, but this depends on the molecule's geometry, and consequently is only well-defined for small molecules that cannot "wiggle" around, such as water. Larger amino acids side chains can wiggle quite a bit, and their dipole moment is difficult to define. Instead, polarity is usually given by rules of thumb like "hydroxy groups are polar" and "aromatic rings are nonpolar. But then there are borderline cases like tyrosine that has both an aromatic ring and a hydroxy group. Hydrophobicity is related to polarity, but it is an experimentally measured quantity, usually determined by how an amino acid partitions between water and nonpolar solvents, or by observing how it orients in folded proteins (towards or against the water solvent). More detailed information is found here. But the results of such experiments don't always agree, and so amino acids which are borderline hydrophobic/hydrophilic can be difficult to classify. For example, for two amino acids X and Y, we might find that X dissolves better in water than Y, so X appears more hydrophilic in this sense; but at the same time, X could also partition better into a lipid bilayer, so in this sense X appears more hydrophobic than Y. In such cases, the various scales of hydrophobicity will differ. Proline is a bit special in that it does not have an -NH3 group; the amine nitrogen binds to the side chain -- it is more of a "loop" than a chain -- and the peptide bond is different. But this "side loop" clearly has no polar group, and I think there is good agreement that proline should be considered nonpolar. The Khan Academy page is probably mistaken on this one. Proline is intermediate in hydrophobicity. Tyrosine: As mentioned, polarity of the tyrosine side chain is unclear since it is quite large and has both polar and nonpolar groups. Tyrosine is somewhat hydrophobic, but among the amino acids, it places itself near the middle on most hydrophobicity scales. So tyrosine is a borderline case, which explains why different sources disagree. Cysteine is special in the context of proteins, since cysteine residues often pair up via disulfide bonds, and this changes its properties. By itself, the -SH group is polar (although less so than an -OH group) so the cysteine side chain is somewhat polar. It is intermediate in hydrophobicity as measured by solvent partitioning. Cysteine was considered hydrophobic based on the observation that cysteine is often found in the interior of proteins, away from the water solvent; but this is largely due to its ability to form disulfide bonds.